Hello, everyone! Today I'm sharing an anniversary card featuring flowers and butterflies. 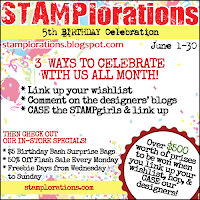 Again I'm joining the STAMPlorations 5th birthday celebration! There is so much incredible inspiration over there that I can't help myself! I feel sad that the celebration has ended, but there is still one more day left to link up your projects! 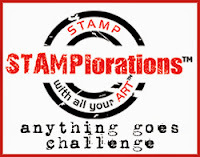 The STAMPlorations birthday challenge is to CASE the STAMPgirls. I decided to CASE STAMPgirl Carol's card - I was inspired by the florals, butterfly, and card design. I was also inspired by Mrs. A's Butterfly Challenge. The theme is Spin the Butterfly Wheel with the Letter V - I went with all three colous (Violet, Vegas Gold, Vermillion), Vine Leaves, and Vertical Pattern. I couldn't fit in the Vintage Style, oh well. Also linking up to the STAMPlorations Never-ending Anything Goes Challenge! What pretty blooms! Love the vibrancy of your card and the leaf trim! I love it. Those blooms are so pretty the way you colored them and the whole card design is super gorgeous! Gorgeous card Kitty, and getting six of the elements was no mean feat. I love those beautiful vermillion flowers. Thankyou for coming and spinning the butterfly wheel with me this week. Hugs Mrs A. What a fabulous and vibrant mixed media card, and 6 of the 7 Mrs. A's challenge, wow, way to go! Beautiful colors and flowers!!! Fab Design! Kitty, this is beautiful. Love the bold colors. Awesome background! This is just lovely! Thanks for sharing it with us at Lil Patch of Crafty Friends! Great CASE. I love how you colored the flowers. Thanks for helping STAMPlorations celebrate 5 years. The coloring page is beautiful and beautiful color combination, and like the distribution of the colors. Thanks for sharing with us at Double Trouble. This is gorgeous, beautiful colours and great colouring. What a gorgeous card. Simply stunning. Thanks for playing along with us at PIP Challenges. Hello… Thanks for entering another one of your lovely cards into the ‘Anything Goes’ challenge at Scribbles Designs… please join us next time and Good Luck in the draw. Wow! What a beauty! The colors are so vibrant. Thank you for sharing at the Double Trouble Challenge. 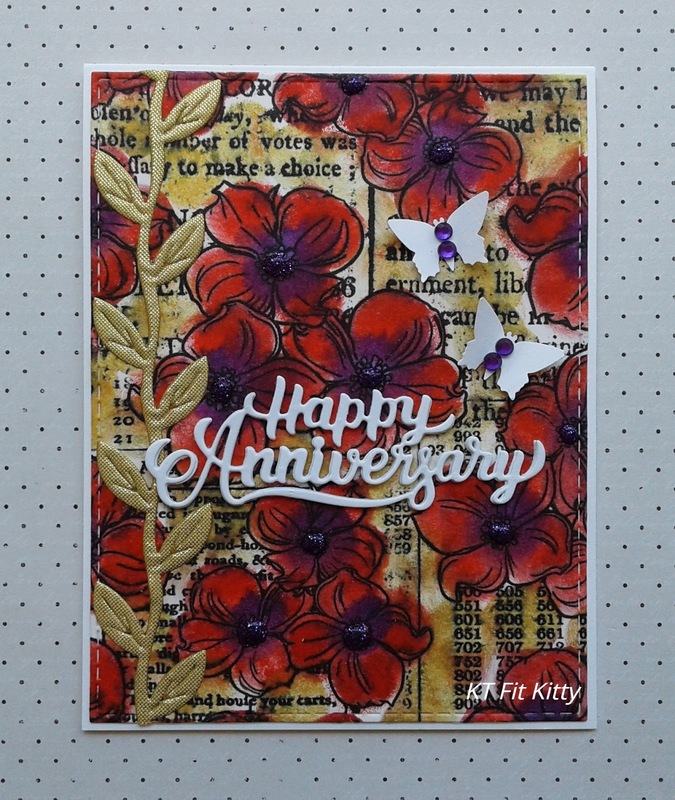 Thank you for joining us at Double Trouble....Love the colors that you chose for your card. This is a lovely creation. Thanks for joining us at Card Mania Challenges. Good luck and hope you'll join us again.